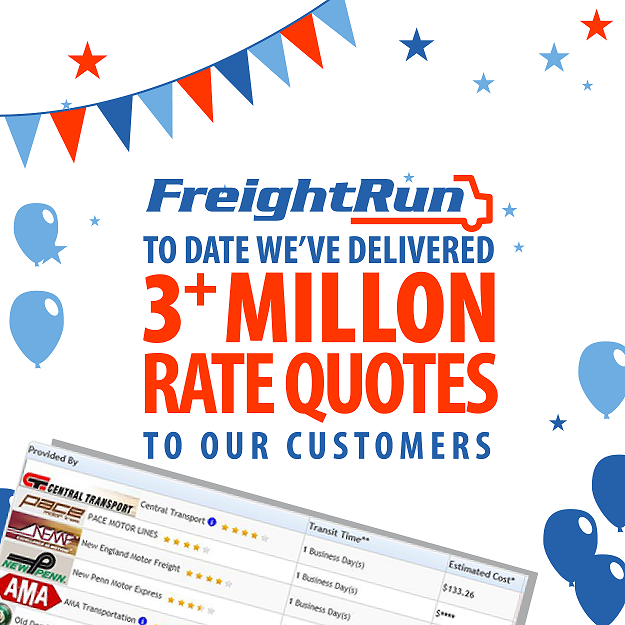 FreightRun has displayed 3+ Million rates from various carriers to our customers! Thank you to all our customers for your loyalty! With 3 decades of experience, the principals of FreightRun.com are at the edge of automated logistics solutions for small to mid-size companies, attempting to optimize and master their supply chains. We are a full service logistics provider that can effectively manage your Full Truckload Program and Less Than Truckload Program. Customization of the top-end logistics’ tools is a necessary component of what we do because your business is different from every other, and to give you a competitive edge critical adaptations are useful. FreightRun.com can implement such critical adaptations quickly. Faster way to shop for best rates. Carrier agnostic systems – your Team specifies acceptable carriers via global or load-by-load instructions. We provide proactive Customer Service to your clients throughout logistics process – reduce or remove this burden from your staff if you choose. Solve capacity crunch issues by providing huge carrier base plus dedicated solutions when necessary. Intelligent LTL combination into dedicated FTL – decreases claims, decreases transit times, increases control. Single point of contact for you and your clients. Automated pricing, automated tracking, automated POD, automated payment processing. We commit the resources necessary to empower you, our clients, to better manage your own resources and to make your staff more productive, more empowered. To be competitive on the scale required by today’s marketplace, entrepreneurs and growing companies need a focused and dedicated logistics company with the full resources to put the right materials and goods in the right place at the right time. FreightRun.com is an essential partner for growth and is uniquely flexible in the technological sense first, but also in its thinking and operating solutions – we design our resource and teams around your needs not the other way around! Check our rate calculator and contact us today!